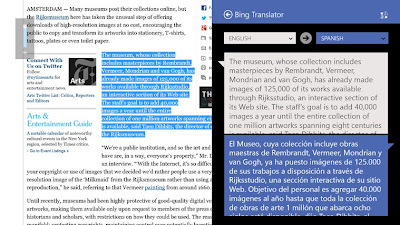 Microsoft launched Bing translator app for Windows 8 and Windows RT computers, lets you instantly translate content in more than 40 languages without internet connection. Just point your web camera at printed text, it automatically converts and shows translated texts on top. With this app You can also type to translate with your keyboard and hear translations spoken with a native speaker's accent. Bing translator for Windows 8 enables you to translate contents while browsing and chating on the internet. The app currently supports 40+ world languages, and more language packs coming soon. Now you can download updated Bing translator app from Windows Store.